Have you ever heard of Fairy Bread? 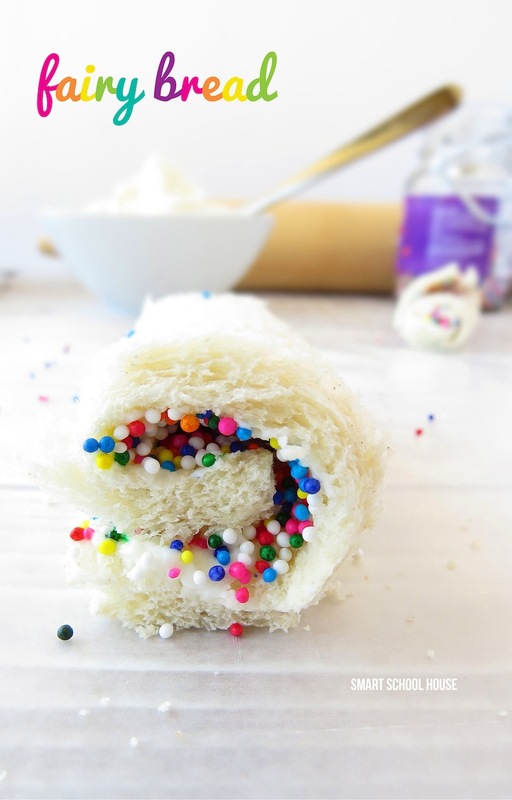 Fairy Bread is a simple dessert snack filled with lots of imagination and fun! Do you know what fairies eat? We don’t know for sure. But, we’ve pretended that the fairies taught us this exact recipe because because they know how much we love them. It’s pretty special, don’t you think? Fairy Bread is perfect for a special treat inside of a lunch box, a colorful dessert at a party, or even a gift to friends! With just a few ingredients and the help of a parent, this Fairy Bread can be made with the hands of sugar and fairy loving kids. This is so awesome!! Love!! Kelly! My neighbor and good friend just created a fairy garden with her daughters this summer. Her girls are still patiently waiting for the fairies to arrive. I think this may be just the thing to lure them in. No matter who makes this, I’m sure it will be enjoyed with a smile! In New Zealand this is a party favourite, but we make it a bit differently. We spread soft butter on bread, add sprinkles, cut to size/shapes with cookie cutters and serve. No mixing and added sugar, the sprinkles do just enough. Sugar galore!! And we wonder why USA is exploding w obesity! Way to make unhealthy obese children! Ugly comments like yours are not welcome here, Erin. Everybody knows, if you don’t have something nice to say…..
It’s not a bright idea to insinuate that my children are unhealthy or obese. Watch your words (it’s called common decency). Maybe you should focus your attention more on improving your social skills rather than criticizing other people’s kids. Again, your ugly comments about my children are not welcome here. I think it’s great that it uses cream cheese! At first glance I thought it was icing. Kids just love a way to add sprinkles to their otherwise plain food. This would be a great alternative to store-bought sugary treats! :-). Thanks for posting. Erin: my kids are underweight, actually. But I would rather they explode with obesity than with a lack of civility. I hope you can see that your comment could be hurtful to others, and I really hope you didn’t intend it that way. This is an awesome idea! I think it would work for an idea for the elf on the shelf at Christmas too. Thank you for sharing this. In Holland, there is a special treat similar to this. We use “chocolate hail” on white bread and butter. Probably similar to chocolate sprinkles for cakes and cupcakes. It is a treat and I can assure it does not promote obesity. I love the name of fairy bread. my little girl would love to make and then eat this but just as a treat!! Erin check your face! I love this idea! Thanks for sharing! It is ok for children to have candy/sweets in moderation…common sense often times is not so common Erin!! My granddaughter and I just finished our fairy gardens. We need this to entice the fairies to leave us some fairy dust. What a wonderful idea. The fairy bread will do the trick. Thank you so much for your beautiful blog. Keep up the good work.